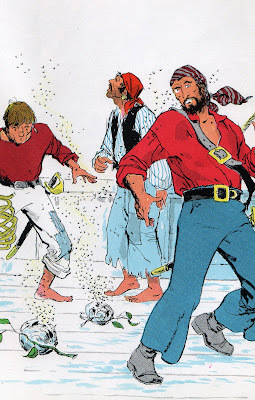 Vintage Kids' Books My Kid Loves: Look Out For Pirates! I have to admit, anytime I see a vintage Random House Beginner Book, I always buy it, no matter what it is. Partly because I have a shelf that holds just this series and it is good to keep up the collection. And partly because even if they aren't your favorite books in the world, there will be something awesome about them. It was a dark night. It was hard to see. But Captain Jim and his men worked fast. They put bag after bag of gold into a box. Then Captain Jim and his men put the box of gold on his boat. They had to get this gold to another town. There were pirates here. And the pirates wanted this gold. Though it is never explained where Captain Jim and his men got the gold from in the first place (unbagging gold into a treasure chest in the dead of night? fishy to say the least), the fun begins here as (of course) a hidden pirate is watching their every move. I won't give away the story in full, but know there is a ship wreck, some deserted island fun, scuba diving, the aforementioned shark incident and the foiling of an evil plan that involves a hornet's nest. Penned by a onetime Nancy Drew writer, whether your kid is the swashbuckling type or simply a sucker for all thing mystery, three thumbs up on this delightful maritime adventure. My brother is looking for this book, we used to have it as kids and we memorized every word. Thanks for bringing back memories! I remember this book from my Grandparents house when I was just a kid. Now that I am a diver I have found memories of this book but had long forgotten its name until now. Thanks for resurrecting a long lost memory, hopefully I can find this book and keep a special part of my childhood alive for my kids. Thank you! My fave book as a young boy. It's just the best book ever, Vinton and Vestal captured something magical here. My copy must be 40 years old and I read it to my kids again last night!